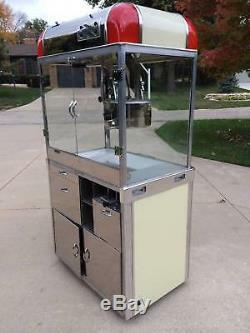 Manley 1948 M-Line M-48 Commercial Popcorn Machine Restored Pristine & Rare Nice. 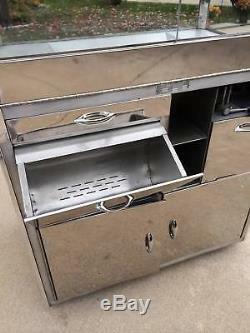 Showed their restoration of a vintage mid-40s Manley popcorn machine, sales of those machines took off! 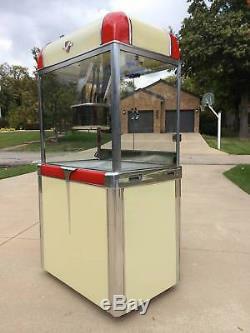 Collectors who want a real cool vintage popcorn machine are gobbling the machines up. 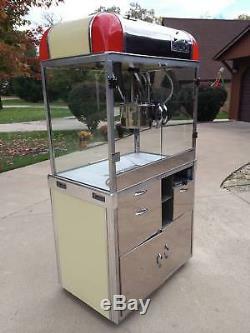 This is a Manley M-48 commercial popcorn machine. It was made in 1948. Advertised as a lifetime model, they were the workhorses of the commercial poppers in their day. This Manley is serial number 7174. It was last used in 1982 when the roller rink closed. It was placed in storage until 2011. This machine has a large 12-ounce aluminum kettle with a built in thermostatic control that turns off the heat when its temperature is 5-10 degrees hotter than its supposed to be for popping corn. There is an exhaust fan that removes the steam and aroma of popping corn from inside the machine that keeps the moisture away from the glass. The popped corn rests on a heated warming pan to keep it fresh. 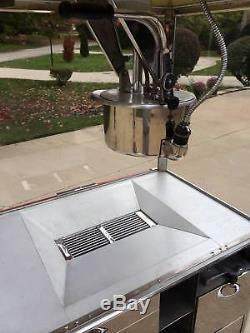 There is a heated removable butter bin called Seas-O-Matic which uses a crank handle to measure the correct amount of popcorn oil. It puts it directly into the kettle by way of a heated seasoning tube. 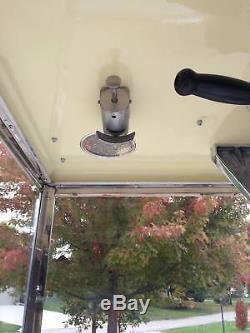 There is a Salt-O-Meter that allows the attendant to place a corn cup against its lever and while pushing deposits the correct amount of salt into the cup. The top left drawer is a cash drawer. The drawer beneath it is the corn bin. The bottom drawer on the left side is the waste drawer used to catch old maids and half-pops. The bottom drawer on the right side is a general utility drawer. 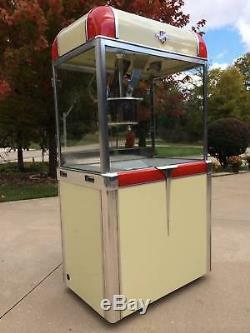 The display lights include two to illuminate the popcorn, two to illuminate the red accents in the front of the machine and six others to light up the red and white plastic accents on top of the machine. 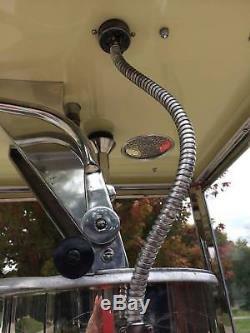 There is a 110-volt twist plug with removable 12-gauge cord. The machine has an original operations manual. This is a complete frame-up restoration. There is a new stainless floor and aluminum side panels. The machine is completely rewired with color-coded wiring linked to independent terminal blocks. This means modular pieces can be removed for servicing. 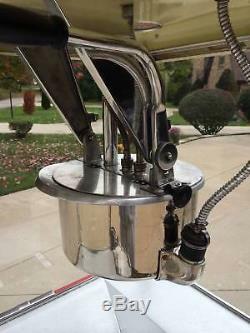 The machine has its original pan, kettle and glass. All panel switches have been oiled and tested. The heated seasoning tube is new aluminum restaurant approved food tubing with rewired heating element. The white plastic top panels are original. The red plastic pieces have been recreated in the same likeness as the originals. There are new handles on the drawers and doors. The original trim has been professionally polished. 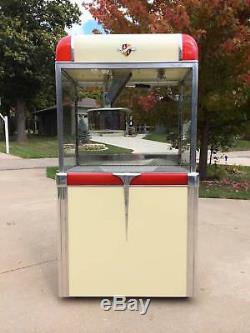 The Plexiglas doors for the popcorn bin are new with re-chromed hinges. Side panels are new aluminum and are painted the correct color used in 1940s. 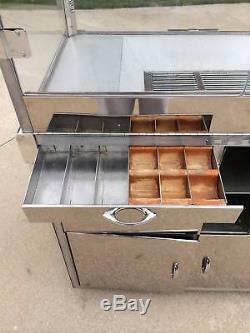 It is rare to find a Manley M-line with the top cover, butter bin and right lower storage tray intact. The price is reflective of the rarity, value and condition of this machine. Pick-up in person is recommended. Eight one five 223 zero nine zero nine. Get images that make Supersized seem small. Tailor your auctions with Auctiva's. 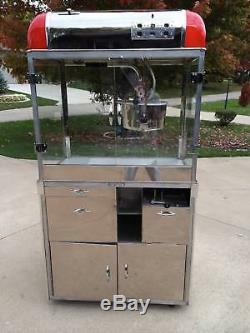 The item "Manley 1948 M-Line M-48 Commercial Popcorn Machine Restored Pristine & Rare Nice" is in sale since Monday, September 24, 2018. This item is in the category "Business & Industrial\Restaurant & Food Service\Vending & Tabletop Concessions\Vintage Equipment". The seller is "drfusion" and is located in Peru, Illinois. This item can't be shipped, the buyer must pick up the item.